In a scene reminiscent of a French terror attack in Nice where a man killed 86 people by plowing his truck into a celebrating crowd, a man in New Orleans is in custody for allegedly driving his vehicle into revelers and injuring dozens on Saturday—five seriously. Yet in this case, police are leaning toward DUI, not terrorism. “We suspect that that subject was highly intoxicated,” Police Chief Michael Harrison said Saturday evening. The Associated Press reports that thousands lined the streets of Mid-City for the Krewe of Endymion parade on Saturday, when a man driving what has been described as a gray or silver pickup truck drove into the crowd and injured at least 28 people. Twenty-one people were hospitalized after the crash, with five victims in serious condition. Seven others declined to be hospitalized. 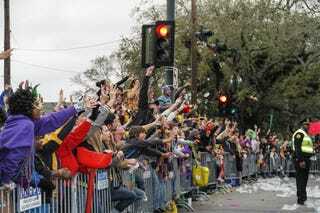 According to CNN, the Krewe of Endymion holds the city’s largest Mardi Gras parade, with an annual budget of $7 million. It boasts 81 floats and 3,200 riders, and many parents bring children to the family-friendly parade. One woman at the scene reportedly told the New Orleans Advocate the driver of the truck seemed almost unaware of what he had just done. “He was just kind of out of it,” Kourtney McKinnis, 21, said. New Orleans Mayor Mitch Landrieu weighed in on Twitter and thanked first responders for helping those in need. Read more at the Associated Press and CNN.